Whole milk, nonfat dry milk powder, all natural geletin, live & active cultures. Q: What is the protein content? Q: What is the carbohydrate count in 8 oz. of the plain yogurt? A: There are 15 grams of carbs for an 8 oz. 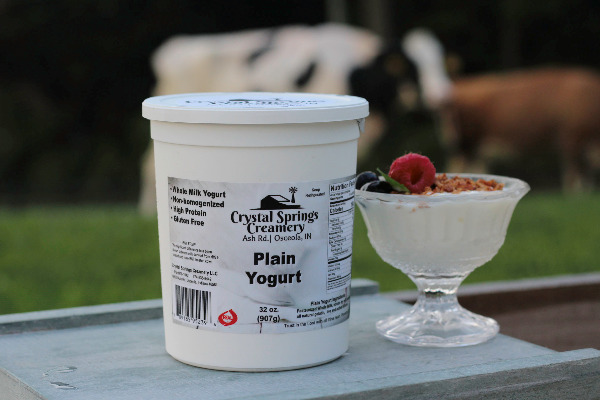 serving of Plain Yogurt. Q: Hey just checking if made from grass fed cows? A: No our cows are not pasture raised. They live in a barn which keeps them comfortably cool in the summer with the use of fans and sprinklers and also nice and warm in the winter. They have a two month dry period(maternity) per year and weather permitting they can have access to a pasture during that time. Q: What is the all natural gelatin derived from?